It's easy to lose track of your cell phone or mobile device. And once your device is gone, so, too, is all of the data it holds. Enter CyberSynchs ($3 a month; seven-day free trial). This mobile application and Web-based service work together to make sure that your data doesn't disappear. The idea is a useful one and the app is, for the most part, very easy to use. Unfortunately, though, this beta version still suffers from a few bugs. At Cybersynchs.com, you can access all of the files that have been synched from your phone, using the site's colorful and easy-to-browse interface. 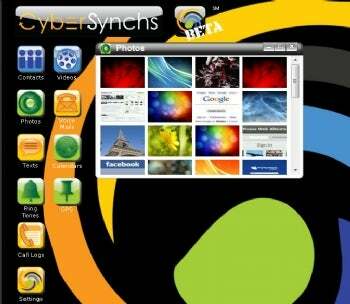 CyberSynchs calls itself a "data synchronization system" that is made up of three parts. One is the mobile application, one is a Web-based interface for accessing the data synced from the mobile device, and one is the optional desktop version, which is usable when you're offline. To get started, you must sign up for a CyberSynchs account from your desktop computer. You'll need to enter some basic information, such as your mobile phone number, wireless carrier, and mobile operating system. Within the mobile app, you can choose which information you'd like to sync to CyberSynch's servers. Your options are: contacts, call logs, calendars, texts, ringtones, GPS, photos, and videos. You then select how often you'd like to sync, with options ranging from every hour to once a day, or manual syncs only. The first sync can be a bit time-consuming (mine took nearly 15 minutes), but subsequent syncs were much faster, completing in less than a minute many times. I had a bit of difficulty here, though. I first tested the app on an HTC Droid Incredible, which had 97 photos in the camera's gallery. When I looked at the Web interface, I was surprised to see that more than 100 photos had been synced from the phone--but unfortunately many of them were not from my camera gallery. Instead, I saw sample photos that had been stored on the phone's SD card, as well as screen grabs from what looked like every Web site I had ever visited with the phone's browser. Likewise, none of my videos showed up. CyberSynchs CTO Tyler Thackray told me that the Android app is programmed to pick up whatever it identifies as a photo, which explains why I was seeing screen grabs of Web pages. But he was unsure as to why the app was missing several photos that it should have identified. He says that the company will have to look into this. I had better luck when I tested the app on the Droid X. This time, all of my photos were synced appropriately--those from the photo gallery only; no random Web pages here. But not all of my text messages showed up as expected. CyberSynchs is free for 7 days; after that it costs $3 a month. I'd be hesitant to pay that fee until these bugs are worked out. If CyberSynchs can solve these glitches, however, $3 a month seems like a small price to pay for mobile peace of mind.